The Tivoli Preserve Community Farm is a community space for urban agriculture and environmental justice in the Arbor Hill and West Hill neighborhoods of Albany, NY. We care for sheep, chickens, and alpaca. The farm also includes a community garden, a composting program, a wool cooperative, and youth programming. 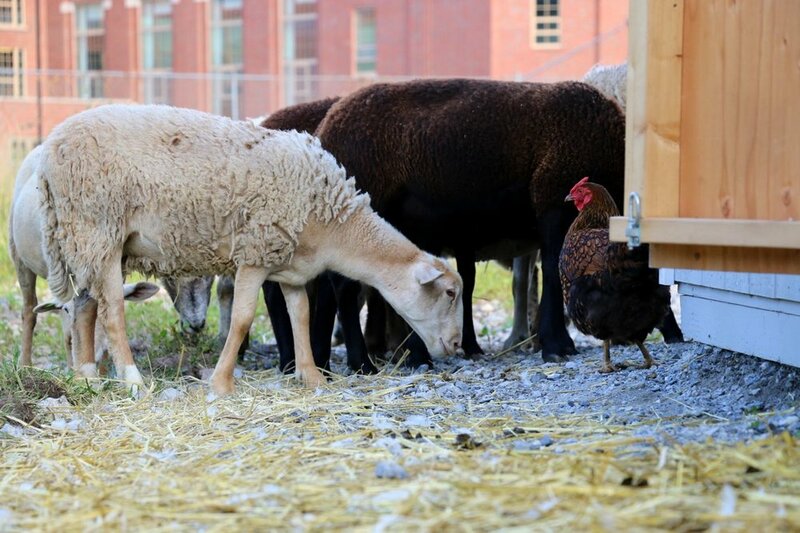 The farm is made possible through cooperation with the City of Albany and NYS Department of Environmental Conservation. Tivoli Preserve Community Farm is a steward of the surrounding environment and community by facilitating agricultural activity that empowers individuals in order to promote health, peace, and well-being for all. The farm (1) provides healthy food at affordable prices to residents in the West Hill and Arbor Hill neighborhoods in Albany, New York, (2) provides opportunities for our community to interact with nature and the food system, (3) creates shared experiences among people of diverse backgrounds to promote social healing and unity, and (4) operates cooperatively and non-violently. Tivoli Preserve Community Farm has three main areas of focus with a shared goal of building community. We use a small flock of sheep to graze out phragmites, an invasive wetland reed, from the Tivoli Nature Preserve. We work with the local community and restaurants to recover food waste and turn them into nutrient-rich compost. We have a community garden and are dedicated to working collaboratively to learn and grow food together. There are many ways in which you can support our project. We have a dedicated team of volunteers that care for the animals, process compost into healthy soil for the farm, and tend the community garden. We are grateful for the generosity of supporters. Your donation supports our project and helps us provide more programming for the community. Our farm is currently seeking a senior high school student for a paid internship position. The student will be interested in agriculture and social justice. We are located at the Tivoli Nature Preserve. The farm is in the old baseball field across the parking lot from the Livingston School Apartments. Parking is available around back of the Livingston Apartments (former Livingston Middle School) via McCrossin Avenue or at the end of Wilkins Avenue. You can also access the farm through the Tivoli Lakes Preserve with parking available on Judson Avenue. Leave us a message; we'd love to hear from you!